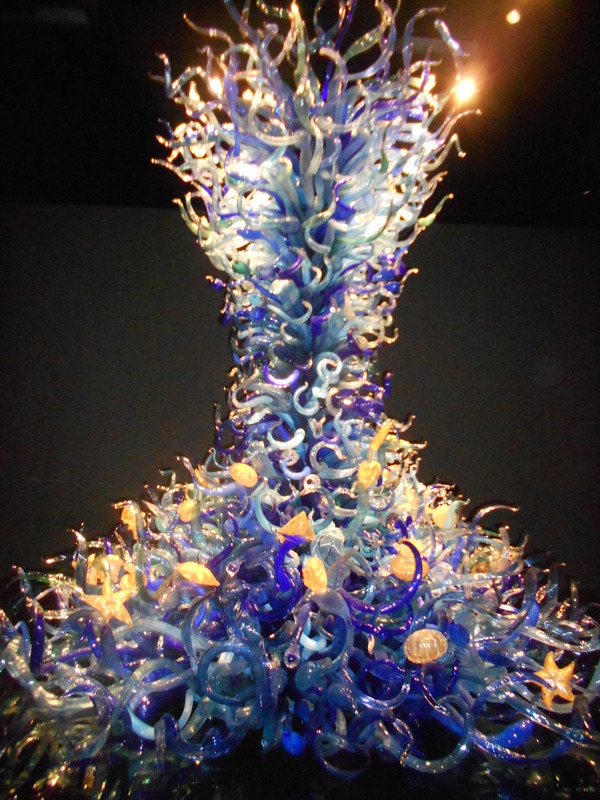 I visited Chihuly Garden and Glass Museum in Seattle and viewed wonders made by Dale Chihuly, born in nearby Tacoma, Washington. I loved the foot-wide flowers hanging from the glass “greenhouse” that glowed in the sunlight with shades of orange and yellow. I marveled at the eight-foot tall sculptures with so many blown pieces in differing shapes. I thought about the artist, standing on a ladder carefully assembling them and marveled at his patience. One exhibit, featuring items assembled in boats was inspired by Chihuly’s experiments with glass balls in Nuutajarvi, Finland, where he worked at the famous Hackman Glass Works. He tossed glass balls into a river to see what would happen. After seeing teenagers in rowboats gathering the balls, he made an exhibit with balls of different sizes and colors in a boat. Inspired by fishing boat floats, he called this Niijama Floats. The other “boat” held glass forms of different sizes, shapes, and colors resembling stems, reflected in the black mirrored surface below. He called that Ikebana after Japanese flower arrangement traditions. An exhibit of various forms and colors, some resembling swans, longer than my thirty-foot living room filled one whole room. Another room held flowers three feet across in different colors placed six feet high. Outside, I walked past tall, slim cylinders in blue or red, resembling candles, and a tall yellow green glass bush. Set among natural foliage, it looked like a real plant. I guessed it was from ten to fifteen feet tall. Not long after my arrival back at DFW Airport, I had an appointment with my oncologist and again saw Chuhuly’s orange and yellow creation at UT Southwestern’s Seay Biomedical Building in Dallas. 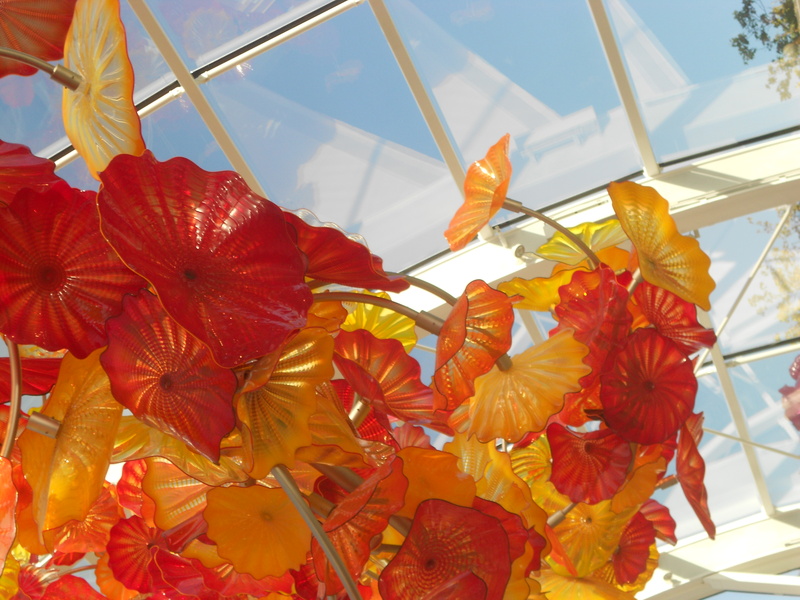 The sculpture consists of 1,100 hand-blown glass elements, flown from Seattle and assembled in the lobby of the building. And best of all, I have pictures on my camera and my phone and will add three to this article. 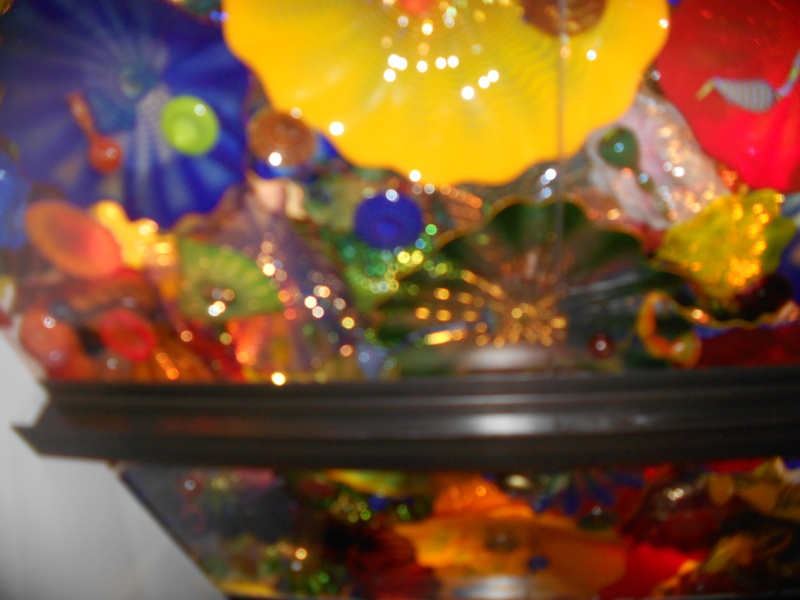 This entry was posted in Delicious dishes and tagged Chihuly, Glass sculptures, sculptor. Bookmark the permalink.